So in an attempt to use the mouse Less, Im trying to map certain keyboard shortcuts to windows actions. (Almost) first on my list is minimising and maximising windows. Except, I don't have Kwin listed in the component list. So I fire up my laptop which has Mint Kde installed, go to the same place, sure enough kwin is listed, with all its magical goodness within. Logic would suggest "Install the Kwin package" but clearly thats already installed! There is a "+" at the bottom, but no where does it give me the option of adding Kwin to the list. Have to admit I'm not entirely sure from what package those settings originate. 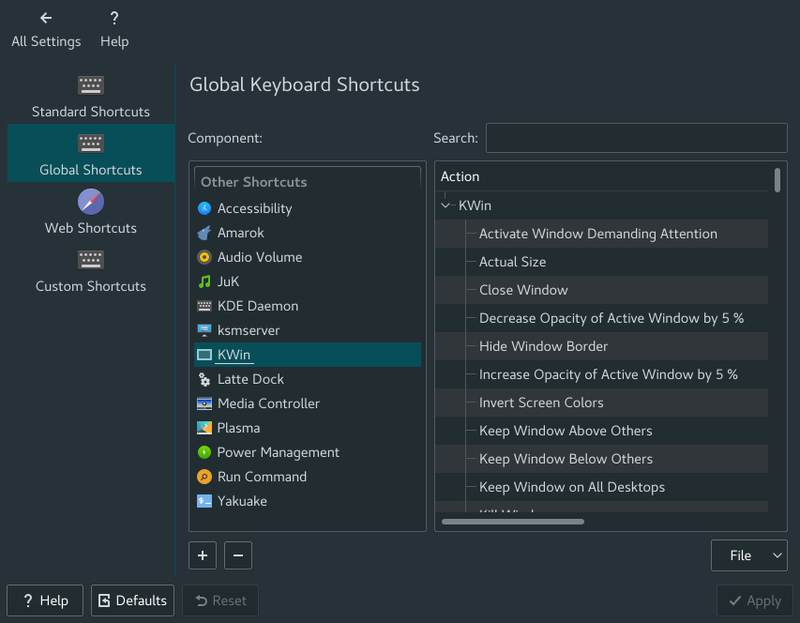 How did you install KDE in the first place? I don't think I did much beyond emerging plasma-meta myself, and I have a KWin component in my Global Shortcuts settings. It might be worth comparing what you have installed to what the kde-base/plasma-meta ebuild would pull in. Yes that must be it, I generally install plasma-desktop (as I have in this case) to keep the foot print down. and restart kde! Happy days. Thanks superjaded for your reply.